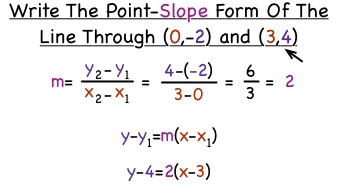 How Do You Write an Equation of a Line in Point-Slope Form If You Have Two Points? Trying to write an equation in point-slope form? Have two points but no slope? You'll need to use those points to find a slope first. Watch this tutorial and see what needs to be done to write an equation in point-slope form! How Do You Write an Equation of a Line in Slope-Intercept Form If You Have Two Points? Trying to write an equation in slope-intercept form? Have two points on your line? You'll need to find your slope and y-intercept. Watch this tutorial and see what needs to be done to write an equation in slope-intercept form!